St. Collins Lane embodies a mindset that resonates with the individual – an established set of attitudes for the style conscious, uninhibited, urban character. Marching to their unique beat. Melbourne’s famed Collins Street precinct cemented its reputation as the destination for international design labels and favourite local brands when St. Collins Lane opened its doors at 260 Collins Street in May 2016. Welcoming visitors with a sophisticated retail offering, St. Collins Lane houses fashion favourites including Coach, TAG Heuer, Leica, Bremont, Zadig & Voltaire, Maje, Sandro, Reiss, Furla, The Kooples, MJ Bale, Rodd & Gunn, Birkenstock, CUE, Jo Mercer, Calibre and Australia’s flagship Debenhams store. Originally designed in the 1990s as a series of half levels accessed by a confusing network of sloping ramps, the former Australia on Collins site undertook a $30 million redevelopment in 2014. It now houses 9000sqm of retail space with 30 boutiques and an array of fast casual dining across the level two food hall. Since its opening, St. Collins Lane has become a part of Melbourne’s diverse identity. The grand building plays a distinct role for each of its varied visitors: a laneway for city workers to walk through on their way to work, a place to stop and get a coffee, somewhere to meet a friend for a drink or dinner after work, and of course a luxurious fashion destination to access the best brands from around the world. St. Collins Lane is your must-visit destination. Designed by ARM Architects, who was appointed to the St. Collins Lane redevelopment after winning a competitive design competition, the retail precinct is elegant and contemporary. 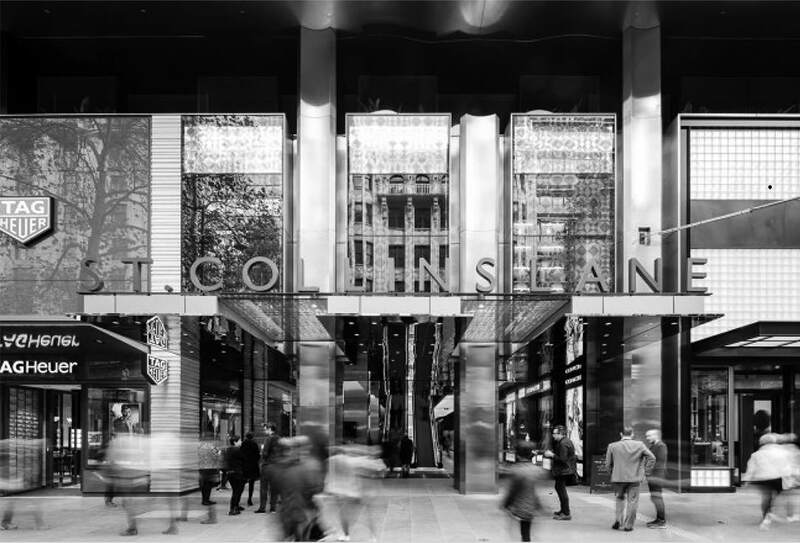 Seamlessly integrating the sophistication of Collins Street with the gritty vibe of Little Collins Street, the design of St. Collins Lane steers away from the typical retail experience. Each level of the centre has its own design language, differentiating from floor to floor through spatial and material changes. One of the most recognisable features of St. Collins Lane is the green sculptural lightscape that runs the entire length of the second-floor canopy, elegantly falling through voids at alternating heights to create a breathtaking centrepiece in the space. This stunning installation also has a practical functionality; it effectively acts as a buffer between the internal area of the retail precinct and the Novotel hotel rooms that rise above, creating a boundary that segments these two spaces to provide privacy while maintaining a visual spectacle from above. The lightscape is geometric in design, with thousands of freestanding LED glass bulbs hanging from the ceiling, mimicking leaves falling from trees. The beauty of the twinkling emerald cylinders mean it is not uncommon to spot visitors with camera in hand, dazzled by the breadth of its form. 1890 – The site is home to The Vienna Café Hotel, a highly fashionable place to eat and host business deals and meetings. The Vienna forms part of the fashionable Collins Street precinct known as “The Block”. 1939 – The 12-storey Hotel Australia is constructed and remains a very popular accommodation centre until it is demolished in 1989 to make way for Australia on Collins. Hotel Australia featured a twin screen cinema in the basement and a shopping arcade, Australia Arcade that was touted as the largest in the country. 1992 – Australia on Collins opens, boasting retailers such as Country Road, Jigsaw and craft supplier Lincraft. The centre closes its doors in 2014. 2016 – St. Collins Lane opens its doors to the public in May with flagship stores Coach, TAG Heuer, Furla, Sandro, Maje and The Kooples. A must-visit when in Melbourne’s CBD, St. Collins Lane has fast cemented its name as Melbourne’s most unique new fashion offering.